Take your first look to the front and into the mirrors for traffic and pedestrians to assess your surroundings and then get yourself ready to move. Press the clutch down as far as it will go. Select first gear. position your left hand on handbrake, right hand on steering wheel. Check your left shoulder and left door mirror first to check for pedestrians who may move in front of the car just before moving off (for example kids on very fast engine powered scooters). Then scan the road ahead, for overtaking cars for instance. Check interior mirror for a true impression of the road behind, then right door mirror for a motorbike for instance you couldn’t have seen in interior mirror. 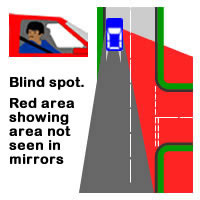 Finally right shoulder into your main blind spot- this is the area not visible in your right door mirror you would be looking onto the footpath over your right shoulder on an average road. Imagine there’s a paper boy about to ride across the road to deliver a paper to a house opposite and he’s coming out of your blind spot in front of your car, or somebody about to drive out of a driveway that’s in the area you can’t see in your right door mirror. Your final mirror check is in case a vehicle has now appeared whilst checking blind spot. Release handbrake then signal if necessary and move off if safe to do so. Putting on more gas (squeeze the gas), bringing the clutch up smoothly and steering to the right to approx 10 past the hour, then steer left to approx 20 to the hour, then straighten up. Now you are on your way - Move into your normal road position, well to the left about 1 metre from the kerb, unless road signs or markings indicate otherwise. Only signal to benefit or to potentially benefit if unsure, another road user. Signal only when necessary and make sure if you do signal, you put the signal on briefly and as late as possible in the sequence, generally around the time of the final blind spot check..or after you take off the handbrake. Imagine you sit at the side of the road signalling right when a car is coming from behind and the other driver decides to let you out and slows down to do this, trouble is they didn’t check interior mirror before doing this and the car behind runs into the back of them, you’ve caused this with your right signal, if there is a car coming from behind you can't move off anyway, the other car has priority. If you are unsure if it’s necessary (for example at night, or there may be people in parked cars) then put a signal on because it may be necessary. Clutch down into first gear, set the gas and find the biting point, position your left hand on handbrake, right hand on steering wheel. 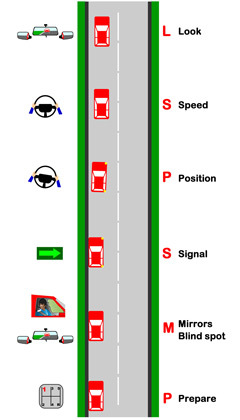 Look over your left shoulder initially as far as you can turn then swing your head in a clockwise direction checking left door mirror/road ahead/interior mirror/right door mirror and blind spot over your right shoulder. Finally another mirror check. Do this before releasing handbrake and moving off. If a vehicle appears mid-checks you need to start all over again before moving off. Release handbrake and move off if safe to do so, signalling if needed, putting on more gas, bringing the clutch up smoothly and moving into your normal road position 1 metre from the kerb, check left door mirror to establish this position or pick a point on the dash to line up. If you stall the car when moving away don't panic, anyone can stall a car. First thing is to apply the footbrake. This will prevent the car from rolling. Apply the parking brake and put the gear lever into neutral. Restart the engine and reapeat the process. Remember don't rush and take your time.